The southernmost community on Hatteras Island, Hatteras Village sparkles with small town charm, where even residents speak in their own local brogue. 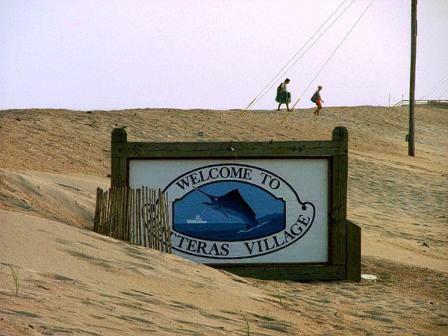 While many of the surrounding communities have been renamed over the centuries, Hatteras Village has retained its historical name. Hatteras originates from Fort Raleigh colonists circa late 1500s and the area was referred to as Croatoan by the indigenous Algonkian Native Americans. Hatteras Village also offers the Graveyard of the Atlantic Museum which is a must see! Famous for its Gulf charter fishing excursions, expansive beaches and rich history, Hatteras Village is also home to The Ocracoke Ferry Docks. A popular day trip, Ocracoke Island and the village of Ocracoke is just an hour ferry’s ride away. Once on the ferry, you can walk around, enjoy the scenery and if you’re lucky spot a dolphin! The trip is free but its best to get to the docks early, as the popular summer months bring long wait lines. But don’t worry, if you get stuck in a long line, Hatteras Landing offers fun family shopping, activities and eateries!